Founder Alan Kaniarz is known around Detroit as a brilliant craftsperson and an innovator in the world of furniture design. Alan’s furniture can be seen at the Detroit Institute of Arts in the Modern wing. 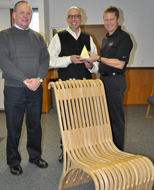 He was also recently chosen to re-create furniture for the Frank Lloyd Wright-designed Turkel-Benbow House in Detroit. In addition to serving as President of Möbel Link, Alan currently holds the post of Adjunct Faculty at the College for Creative Studies in Detroit, in the Foundations & Crafts Department. 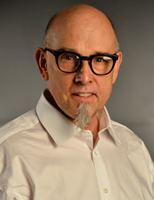 He is also Adjunct Faculty at Wayne State University, where he taught furniture design.It is therefore no surprise that Alan’s unique Möbel Link line of modern furniture is taking the furniture industry by storm – and redefining the way modern furniture is made. 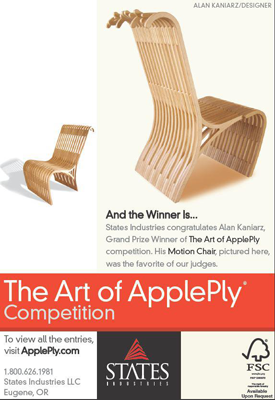 In December, 2011 Alan’s Möbel Link “Motion Chair” won the Grand Prize in the ApplePly International Design Competition. As comfortable and durable as it is beautiful and unique, this elegant chair combines simple graceful lines with solid construction. Judges were also wowed by the unique computer-aided design process, exclusive to the Möbel Link line, which enables craftsmen to construct an entire piece of furniture from one piece of plywood. Further, Möbel Link’s unique, precision computer-cutting process allows craftspersons to make one entire chair, bench or table out of a single sheet of plywood. By using upwards of 85% of that single sheet, much less wood is wasted – resulting in reduced deforestation and far less strain on our nation’s landfills. Each piece of Möbel Link furniture is hand made by talented local woodworkers in the Möbel Link woodshop in the Russell Industrial Center, located in the heart of the City of Detroit. Customers are encouraged to stop by the Möbel Link woodworking shop and see the dedicated craftspeople at work. There they can view a variety of pieces of furniture in varying stages of completion – and be amazed by the unique process that creates an entire piece of furniture from a single sheet of plywood. 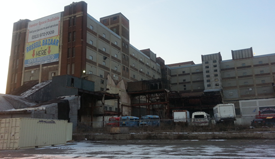 Please call (313)972-1010 at least 2 days in advance, if you would like to schedule an appointment to visit us. At Möbel Link there is no mass-produced furniture. Each chair, table, lounger or bench is created to meet the color and finish specifications of the individual client. And, because each piece is made-to-order, the variety of available woods, finishes and colors is limited only by the customer’s imagination. Browse our catalog to see our current modern furniture designs and select a color, finish and style that is uniquely yours. Owning a piece of Möbel Link furniture is an investment in art and practical living that will serve you and your home or office for a lifetime.